iHeartMedia announced today (October 17) the first-ever iHeartRadio ALTer EGO. The biggest names in Alternative Rock will come together at the historic, “Fabulous” Forum in Los Angeles on January 19, 2018 to celebrate everything Alternative Rock. 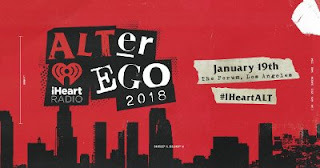 iHeartRadio ALTer EGO is the newest in iHeartMedia's successful roster of major concert events, which includes the iHeartRadio Music Festival, the biggest live concert event in radio history, which features more than 20 A-list artists across every music genre on one stage; the iHeartSummer’17 Weekend by AT&T the nationwide iHeartRadio Jingle Ball Concert Tour; the iHeartCountry Festival; the iHeartRadio Fiesta Latina; and the iHeartRadio Music Awards, which generated 165 billion social media impressions. Beginning December 26, iHeartRadio will launch a nationwide promotion to give Alt-Rock fans across the country the opportunity to win a trip to Los Angeles to attend iHeartRadio ALTer EGO. The promotion will run across more than 75 Alternative and Rock iHeartRadio stations. The event will broadcast live across over 60 Alternative and Rock iHeartRadio stations. Listeners will have access to a limited number of tickets to iHeartRadio ALTer EGO through a Alt 98-7’s The LIST Pre-Sale beginning Wednesday, October 18 at 10 a.m. PT through October 20 at 10 a.m. PT or while supplies last. Tickets go on sale to the general public on Friday, October 20 at 1 p.m. PT via www.iHeartRadio.com/alterego.